The game camera: we can all agree that it’s now essential gear for both hunting and tracking wildlife. This indispensable accessory has provided us with a passive, ’round-the-clock way to monitor the presence of wildlife in the chosen hunting ground. There’s no easier way to improve your hunting experience! The cameras themselves typically consist of two parts: an image recorder (almost always a digital camera) and an infrared or motion sensor. When a deer or other animal walks into its field of vision, the camera automatically snaps a photo. There is a vast selection of good, affordable cameras on sale on the market. Unfortunately, that means it can be a bit overwhelming to choose which is right for you! There are several things to consider, and luckily, we’re here to help guide you through the process of making the right decision when you decide to purchase a game camera and get start hunting or tracking the 21st century way! In this article, we’ll go over the most important features to consider in your prospective game camera. Afterward, we will review three of the top quality cameras on the market. With a much better idea of what to look for—and what’s out there—we’ll make your hunt for the right camera much easier! There are basically two types of game cameras on sale on the market: active infrared and passive infrared. The active infrared models create a beam of light with an infrared emitter and receiver. When this beam is broken by wildlife, the camera snaps a photograph automatically. The detection area is the overlap between the device’s detection angle and range. Conveniently, the range of the camera flash is often the same as the device’s detection range! The detection angle, on the other hand, can very from wide to narrow between models. The detection angle affects the number of photos taken and the device’s battery life. Narrower angles position the animal directly in front of the camera, resulting in fewer captured images but longer battery life. In contrast, a wider detection angle allows your device to shoot many photos within the field of view. Remember that this is ideal for your fast-moving targets! The trade-off is that it will drain the battery faster than its counterpart. Your choice of detection angle, therefore, is determined by your quarry. A wider angle will serve you better when tracking fast-moving animals, and battery life will be a consideration. For all other instances, you should choose a narrower angle and worry less about your batteries. You should be mindful of the trigger speed and recovery time when purchasing a game camera. In simplest terms, trigger speed refers to the time taken by the camera to capture a photo when an animal moves in front of the device. The trigger speed of most cameras on the market falls between 0.1 and 4 seconds. You’ll certainly want a faster camera when dealing with faster animals (between 0.1 and 0.2 seconds), but you can settle for between 0.8 and 1.5 seconds if you’re on a budget or your quarry’s speed allows. A balanced, quality game camera that you can afford. It boasts high resolution (1080P), low trigger time (0.2 seconds), an adequate angle (90 degrees), 5 capture modes, and a ton of features. It’s also a tough cookie, and it comes with a 1 year warranty. 12MP 1080P HD Resolution on your photos and video means you won’t be guessing over blurs or blobs in animage. Night vision (black and white) triggers at about 65 feet. Tons of features. 5 capture modes, and it even has a standby mode to conserve battery. Extremely durable housing backed by 1 year warranty and a responsive service team. SD card and batteries not included. Another entry that boasts a variety of variety of features for a reasonable price. The resolution and trigger speed are comparable to the VENLIFE game camera (1080P and about 0.2-0.6 seconds), and the ENKEEO has a broader detection angle at 120 degrees. It has a 2.4 inch LCD screen, low-glow infrared to avoid frightening game, and another outstanding warranty to support the sale. Energy efficient. It can be set to about 8 months of standby mode. Convenient 2.4 inch LCD screen. Another entry that’s built to last, and and the sale is backed by a 1 year warranty. As always, you’re on your own for batteries and SD cards, so anticipate that second sale. 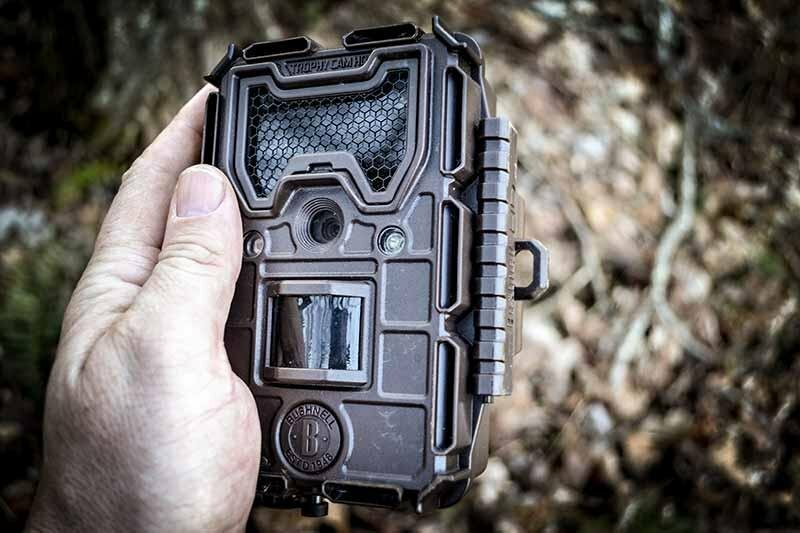 The Apeman Trail Camera comes with the type of features hunters want in a trail camera, so there’s no surprise it’s a best-seller. Amazingly, this unit is among the lowest-priced game cameras on sale. It’s equipped with 26 LEDs that use invisible infrared flash illumination tech to shoot photos of game without startling them. The 65 feet IR flash range and trigger distance ensure smooth operation. Unlike most conventional game cameras, you should expect superb image quality of 12 MP during the day, but you’ll still have to settle for black and white images at night. The multi-shot mode provides three photo captures per detection. Another notable feature that makes this camera popular among users is the durable, compact, and waterproof IP66 body. You’ll get an excellent product lifespan, because this formidable housing will protect the interior of the camera from rain, dust, and wind. Batteries and SD card not included, so make sure you grab them before you start! Any of the aforementioned game cameras are well worth the investment, and you’ll be satisfied with the images you capture. Just stay mindful of your quarry and its area, consider whether you need to photograph a fast-moving animal, how quickly you want your device to recover, and how often you want to bother with its battery, and let the circumstances choose for you when you search for the perfect camera on sale! Happy hunting, and please share your thoughts with us in the comments below!